The Apple Digital AV Adapter gives HD-capable iOS devices a feature they have sorely lacked: the ability to output HD video. We take a look at the device that will change all that. Should I buy the Apple Digital AV Adapter? 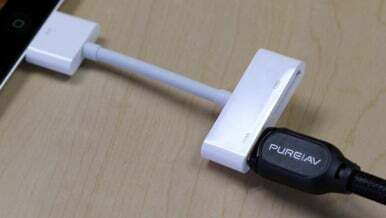 Apple’s $39 (UK pricing yet to be confirmed) Digital AV Adapter gives HD-capable iOS devices a feature they have sorely lacked: the ability to output HD video. Even though the iPad 2 isn't out in the UK for another two weeks, we've managed to get our hands on the iPad 2 and one of the HD adaptors. At last, those HD videos on your iPad, iPhone 4, or fourth-generation (4G) iPod touch can be displayed as they were intended—on a big, beautiful HDTV.